The United States Navy conducts all of their basic training at the US Naval Recruit Training Center located near Waukegan, Illinois. Waukegan is located just north of Chicago. Graduations for seaman recruits are held almost every week of the year. Your seaman will have the most up to date information concerning the date and time of their graduation ceremony. 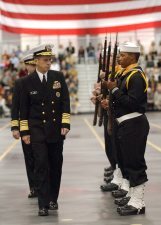 Check out the link below for US Naval Recruit Training Center graduation ceremony information and schedules along with hotels in the greater Waukegan area.